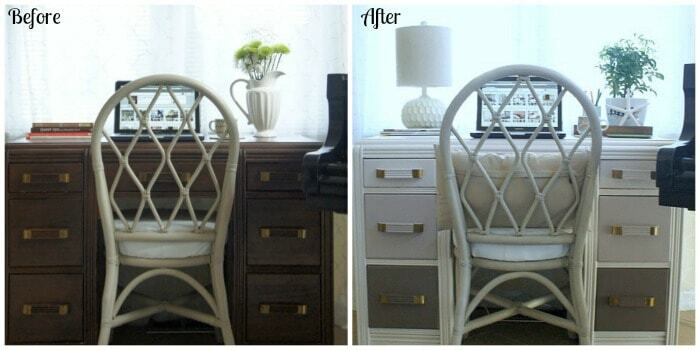 Love Your Space Challenge #18: Repurpose something! Today is finally here! Seriously, I have been waiting to publish this post since the first week of our challenges. So excited. Do you remember challenge #1, move a piece of furniture? I had moved my desk into the living room. Well, I am using it again for today’s challenge. =) If you have missed any of the previous ones or would like to read the intro, just click on a link below. I saved this challenge for the weekend so you can have fun with it. Find something in your house that could use a little love. Maybe a picture frame, lamp, tray, a piece of furniture that could use a fresh new color or a pillow that needs an updated look….. I want you to fall in love with your “things” again! My outcome: I repurposed the desk that I put in our living room in challenge #1. I did actually LOVE that desk, its one of my favorites but I have been wanting to paint it for a long time. So I did. Remember, the challenge can be something really simple like finding a new slipcover for a throw pillow or it can be a bigger project like having a chair reupholstered! P.S. Here’s a before and after! That spray painted lamp came out amazing. My mom use to spray lamps like that and they turned out nice she was the crafty type person me not so much. Love the computer space I need to spruce my little space up too. Thanks Kita! I think I got my craftiness from my mother but she does NOT have my decorating skills….. lol, I love that she calls me before she does anything to her house!! LOL, thanks! I’ve had LOTS of practice! What a great space. I love what you did. Thanks for the inspiration. Thanks so much Tiffany, I am enjoying blogging even more in my new spot! I love the transformation. Getting ready to paint my desk, too. Hopefully it turns out as cute as yours!! great ideas that even my non-crafty self could implement. I really love the texture of the lamp on the desk. Thanks Aria! The lamp was from Hobby Lobby, 50% off and was the only lamp that was the sized I needed. I got lucky! Thanks Dawn! The room it is in stays pretty clean but I did use four and half coats of primer, 2 coats of paint, and sealed it with a furniture wax made for painted furniture. Oh, and I waited two weeks for the paint to cure before I started using it. Keeping my fingers crossed…. Ah — that’s key info there– all that primer. I too have a dark desk I’d like to paint, but I’ve been putting it off, feeling unsure. Thanks for the ideas and inspiration. I can’t believe my desk took four coats of primer. lol If you are able to paint outside (or a well-ventilated area) use an oil base seal and primer (like kiltz) and it should take fewer coats. With that being said, all of those coats of paint, primer, and wax on my desk is holding up well. It gets used hours a day and not a scratch on it! 😉 good luck! You should just go for it!! I love the ombre desk! I must remember to try that. It looks so classy! Thanks so much Joan! I’ve been wanting to paint something ombre and the desk turned out perfect. Your purple lamp redo is wonderful…especially the evenly glossy finish. Do you have the directions accessible to readers? What kind of paint did you use for the desk? i.e. brand, sheen. Surely that’s not spray paint? I just can’t get the hang of spray paint…runs and drips everywhere.